In the heyday of ski jumping at the Leavenworth Ski Hill, competitors climbed a walkway to the top of the large ski jump. Ski jumping competition in 1946. The big Bakke Hill jump in better days. The deteriorating structure can still be seen above the Leavenworth Ski Hill. In the Pacific Northwest, about the only place where beginners can learn big hill ski jumping is in Leavenworth, Washington. The small town of around 2,000 people is probably best known these days for reinventing itself as a Bavarian-themed mountain getaway. Nordic skiing is becoming an increasingly significant tourist draw in winter. But this village in the Cascade Mountains was once home to an Olympic-sized ski jump. North American distance records were set there from 1941-1970. The record jump reached 345 feet, more than the length of a football field. You can see the rickety remnants of the launch ramp high on the hillside above a present-day rope tow. Kjell Bakke, 85, remembers when Leavenworth was the epicenter for long-distance ski jumping in the Pacific Northwest. "They had special trains come from Seattle and Everett. A lot of people came from Spokane,” he said. Bakke recalled a national championship event one year drawing a crowd of 15,000. The Leavenworth Ski Hill hosted its first ski jumping tournament in 1929. The large jump constructed a few years later, now named Bakke Hill after Kjell Bakke's father and uncle, closed in 1978 after holding one last U.S. national championship. Leavenworth produced one U.S. Olympic ski jumper, Ron Steele, who competed at the 1972 Sapporo Games. Bakke said he went off the biggest jump on hickory skis for the first time when he was 14 years old. When Bakke was in his ski jumping prime in the 1940s and 50s, he remembers "almost every" Northwest ski area had a long-distance jump and a team. Ski jumping also took place in the 1930s, '40s and '50s at Mount Rainier, Cle Elum, Spokane, Milwaukee Ski Bowl (now known as Summit East at Snoqualmie Pass, Washington), Mount Hood and west of Bend. By the 1970s, public interest had faded and the Northwest’s historic facilities were all dismantled. Leavenworth's really big jump was the last to go. Unsustainable maintenance and insurance costs contributed to its demise. Periodically someone pushes for a revival, but the prohibitive costs of re-grading the jump hillside to account for greater jumping distances, plus the construction cost of a modern tower and ramp doom the idea. Leavenworth's current ski jumps could be categorized as small and medium sized. They are 15-meter and 27-meter jumps, which refers to the distance from the takeoff to the optimal landing point. The larger one launches jumpers over 70 feet. 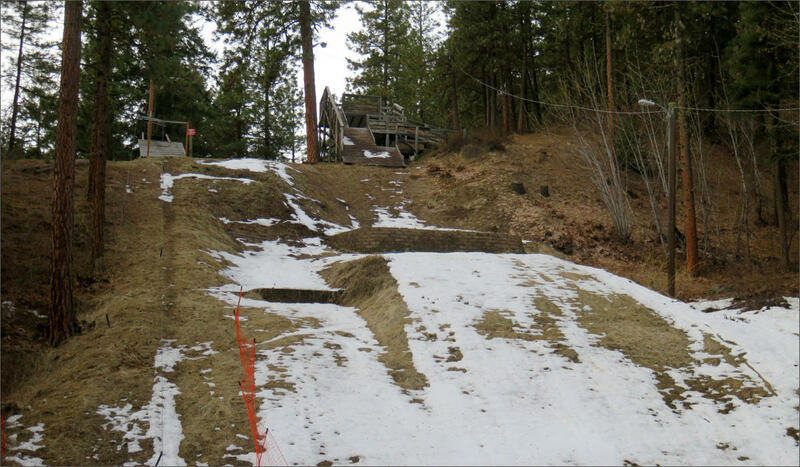 Unseasonably warm temperatures in early February melted the snow at the current, smaller Leavenworth Ski Hill jump, putting it out of service. Still, it’s pretty intimidating to look down from the wooden tower and ramp at the top of the jumping hill. And that is just a fraction of the height the Olympians do at the PyeongChang Games. "Parents below might be encouraging their kids to go off, but they have no idea if they haven't been up here themselves what a steep incline this is -- what it's like to look down and know that you're going straight off that jump," said Leavenworth Winter Sports Club President Brett Johnson. Johnson said plenty of fearless youngsters try the ski jump as well as a few adults. They include Johnson's 15-year-old daughter, Stella. "I started ski jumping when I was really little. I was probably three-ish,” she said. “My dad would hold me in between his legs and we would go off the little jump." Stella has since progressed to the tall jump and is a big fan of the sport. "The first time each year is a little nerve wracking,” she said. “But it's just natural now. It feels fun. I just enjoy it. It's not really nerve wracking anymore." She said crashes are rare. Thirteen-year-old Brendan Fallon said he's pushing himself to fly farther. "It's really special and it is really fun to do,” he said. “If you have the chance to do it, go and do it." If youngsters catch the bug and dream of competing on the world stage, they pretty much have to move to Utah, Colorado or some other Olympic training center. That said, Leavenworth Winter Sports Club coach Rob Fallon said his community is determined to keep its ski jumping tradition alive at its smaller jumps. "We've got the history here,” he said. "The town is a pretty tight-knit community. It's something easy to keep going. I mean, come up here on Wednesdays and Friday nights and it's better than going to the bar." Start 'em young, the other coaches say, and the heritage will fly on. Both of the Leavenworth jumps are currently out of service because the snow cover melted off in recent weeks. When Team USA marches into a South Korean stadium for the Winter Olympics opening and closing ceremonies next month, they'll be swathed in Northwest wool. Team sponsor Ralph Lauren used wool from an Oregon ranch for the patriotic sweaters, mittens and hats.